A map footer is a section with text that is projected over the map in the lower left corner of exported or printed maps or views. This footer contains information on the project, like surveyor name, project description, date and the units and projection used. 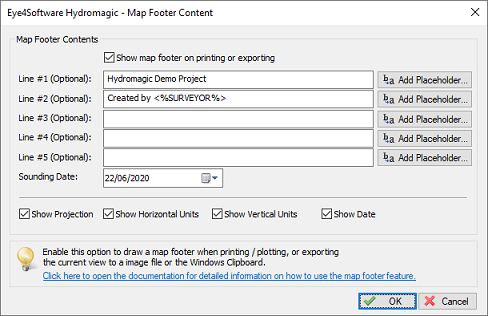 You can choose whether you want to have a footer displayed on your exported or printed map or not. The first two lines of text in the map footer can contain static text, combined with placeholders (optional). Static text means that this text is entered exactly the way it has been entered. When inserting a placeholder, this placeholder will be replaced with a project variable when the map is exported or printed. To insert one of the placeholders that are recognized by the software, click the "Add Placeholder..." button for that line. When one of the "Add Placeholder..." buttons has been clicked, the "Select Placeholder" dialog will be shown. Just select an item from the list, and click "OK" to insert the placeholder into your line of text. 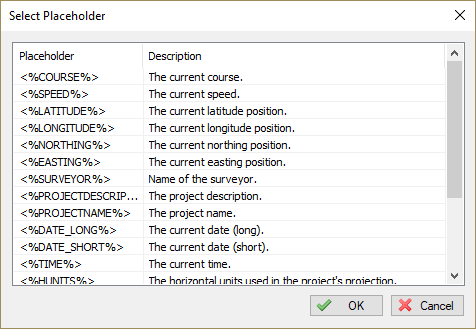 The various placeholders can be found in this dialog along with an explanation on how they will be replaced with project variables. To include the sounding data into the map footer, make sure that the "Show Date" check box has been checked. Next click the date selection control to select which date to display in the footer. This is usually the date the sounding has been performed. 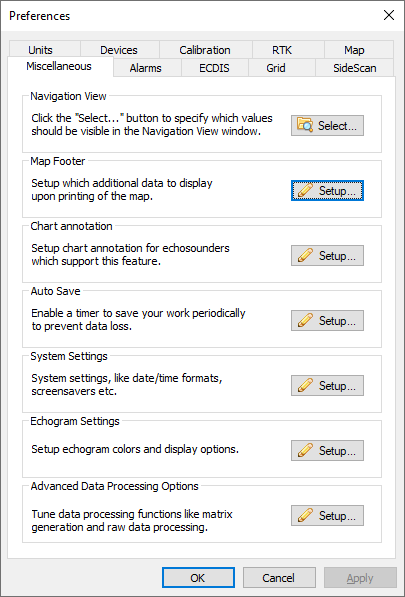 please refer to the "Time Formats" section at the end of the System Options manual page. Include the horizontal units (easting and northing units) used in the coordinate reference system into the map footer. Include the vertical units (depth and elevation units) used in the coordinate reference system into the map footer. Checking this check box causes the local coordinate reference system name to be included into the map footer.